A global credit crunch ensued, sharply limiting credit availability, and triggered an unprecedented, and synchronized economic downturn across the major economies, exacerbated by massive demand destruction. Commodity prices plunged the most in five decades as demand for energy, metals, and grains tumbled in the second half of 2008, because of the credit crunch. After reaching record high on July 3rd, 2008, the CRB Commodity Index fell 56% over the next five months, tumbling to its lowest level since August 2002. At the same time, shipping container rates in the Asia-Europe routes plummeted by 75-percent. About $30-trillion in market capitalization was erased from world stock markets from the peak in October 2007, in the wake of the worst banking crisis since the Great Depression of the 1930’s. The Dow Jones Stoxx Basic Resources Index, home of Europe’s biggest mining companies, and the DJ Stoxx Banking index, were hard hit, both losing 65-percent of their market value. In Japan, the Nikkei-225 stock index fell -42% in 2008, the worst loss in its 58-year history. Shipping companies were slammed by a double whammy. Paralysis in the financial markets dried-up the availability of letters of credit for shippers, - stifling global trade. The Baltic Dry Index, tracking the cost of shipping raw materials, plummeted from an all-time high of 11,793 in May 2008, to below the 800-level, a 22-year low. The key linchpin of demand for commodities and shipping vessels, - China, slashed its imports to $51.3-billion in January 2009, or -43% less than a year earlier. During the historic meltdown in the world markets, the price of copper, collapsed from a record high of $4.20 on May 5th, 2008, to as low as $1.25 on Dec 26th, 2008, the lowest in four-years. The price of crude oil fell from an all-time high of $147.27 on July 11th, 2008, skidding in a nosedive to $32.40 /barrel on Dec 26th, 2008. Wholesale unleaded gasoline futures fell $2.63 /gallon. Overall, the Continuous Commodity Index, (CCI) measuring a basket of 17-equally weighted commodities, lost half its value in five months, in the second half of 2008. But riding to the rescue of top commodity producers was Beijing, with its long-term plans of building-up the country’s infrastructure, - saw a golden opportunity, to begin stockpiling key raw materials at bargain prices. On Nov 9th, 2008, Beijing stunned the world, by unveiling a package of infrastructure spending and other stimulus measures spread over the next two years, on a huge scale of 4-trillion yuan ($586-billion), equaling 16% of China’s total economic output. A few hours after Beijing unveiled its massive stimulus plan, Zhou Xiaochuan, chief of the People’s Bank of China, (PBoC) told the world’s top finance chiefs and central bankers gathered at a Group-of-20 meeting in Brazil, that the Shanghai money markets could expect a big increase in liquidity, lower reserve requirements for banks, and lower interest rates. “Now inflation has been easing remarkably. And the pace of easing is fairly fast,” Zhou said. Nowadays, - the historic meltdown of global stock and commodity markets in the second half of 2008, are becoming a fading memory. Traders are shrugging-off the frightening nightmare of 2008, but instead, are riding high on the magic carpet ride buoyed by “Quantitative Easing,’ (QE. Earlier this week, copper futures hit a new all-time high of $4.27 /pound. Other commodities joining the All-Star band-wagon, - are coffee, cattle, sugar, cotton, and rubber, all soaring to record highs. A second string of high flyers, - crude oil, corn, iron-ore, nickel, and soybeans, are close behind. Stoking the resurgence of the “Commodity Super Cycle” is unrelenting growth in demand for commodities from emerging nations, namely China and India, home to one-third of the world’s population. Crude oil has rebounded to $90 /barrel, aided by China, which boosted its imports of crude oil by 16% in the first 11-months of this year, to 4.6-million barrels per day (bpd). China is expected to account for a third of increase in global demand for oil in 2011, by roughly 500,000-bpd. Ironically, two-years after Beijing put a floor under the commodity markets, it now faces one of its worst dilemmas in decades, - an upward spiral in raw material costs, and booming commodity prices, that can shrink profit margins for its factories, and shrink the disposable income of its citizens. The Continuous Commodity Index is +28% higher than a year ago, and its exerting unrelenting upward pressure on China’s inflation rate. Beijing says consumer prices are +5.1% higher than a year ago, a 28-month high, but private economists measure a much higher rate. Beijing has tried to derail the upward spiral in commodities, by tightening its monetary policy, and hiking margin requirements at its commodity exchanges. The PBOC has lifted banks’ required reserve ratios (RRR) six times this year by a total of 300-basis points (BPS) to a record 19-percent. On Dec 15th, PBoC chief Zhou warned, “We will step-up the use of the reserve requirement tool, which should play its role,” so further increases in China’s RRR are likely in early 2011. The three RRR increases since mid-November will drain a combined 1-trillion yuan ($150-Billion) from the banking system. Yet at the same time, the PBoC is injecting vast quantities of yuan into the foreign exchange market, as part of its effort to rig the value of the yuan against the US-dollar. In November, the PBoC injected 320-billion yuan ($48-billion) into the foreign exchange market, after injecting 519-billion yuan in October. Thus, hiking bank’s RRR to 19% has mostly been used as a tool to sterilize the central bank’s injection of yuan into the FX market. China’s M2 money supply rose to a record 71-trillion yuan in November, standing +19.5% higher than a year earlier, and leaving its citizens shuddering in fear of a rapid loss of purchasing power. For Chinese citizens who seek safety for their hard earned savings, one-year deposit rates at China’s major banks are offered at a paltry 2.50%, far less than the official inflation rate of +5.1%, which has persuaded many Chinese citizens to store their savings in precious metals. The PBoC’s most powerful weapon to control inflation is lifting interest rates. In late October, and early November, the PBoC appeared to be moving in that direction, when it jolted yields on Chinese Treasury bonds higher. China’s benchmark 7-year yield jumped 1% higher to 3.85%, which in turn, triggered a brief shakeout in the global commodity markets. The All-Star line-up of crude oil, cotton, rubber, copper, silver, and soybeans, briefly tumbled 10% to 20% lower. But so far in December, the PBoC has refrained from soaking-up yuan via sales of government T-bills or bonds. The yield on China’s 7-year T-bond has declined 20-basis points to 3.65%. It’s a sign that Beijing isn’t inclined to raise interest rates further, but instead, might rely on RRR hikes to drain and sterilize liquidity. The PBoC’s anti-inflation hawks are quietly surrendering to a higher inflation that’s about to become a more common feature of China’s economic landscape. 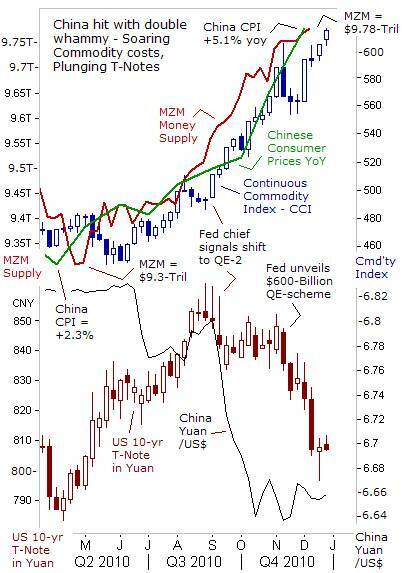 In other words, the Chinese Politburo’s “zero tolerance” for rising prices, is succumbing to the overriding power of the “Commodity Super Cycle,” and the Fed’s QE-2 scheme. So far, the PBoC is enforcing negative real interest rates, - discounted for inflation, to discourage a torrent of “hot money” from abroad from flocking into the Chinese yuan. 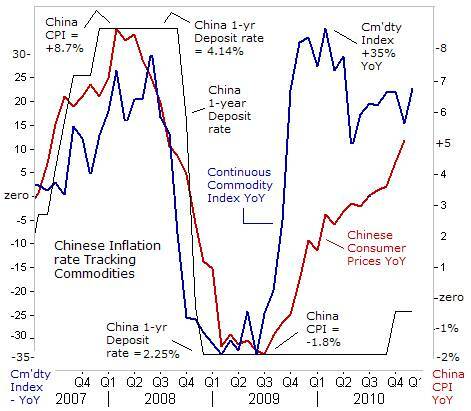 On Dec 12th, Beijing raised its inflation target to 4% for 2011, from this year’s 3%, an indication of what the Politburo sees as the “new normal.” By failing to close the gap between interest rates and inflation, the Chinese central bank flashed a green light to traders to resume buying commodities, and precious metals. Beijing is caught in between a “rock and a hard place.” Beijing understands that if it allows the yuan to strengthen further against the US-dollar, to artificially lower the cost of imported commodities, that base metal and crude oil dealers could seize upon the move to jack-up commodity prices, given China’s increased purchasing power. There’s also lingering doubt whether unilateral PBoC rate hikes could derail the powerful “Commodity Super Cycle,” without the joint support of other key central banks, willing to tighten their monetary policies in tandem. China’s foreign exchange reserves, the world’s largest, are estimated to have risen towards $2.75-trillion in November, with roughly a third of its stash, or $907-billion parked in US-Treasuries in October. But since the Fed began its QE-2 scheme on Nov 4th, the value of the US 10-year T-note, measured in yuan, has declined by nearly 5-percent. Beijing’s second largest holding of foreign currency, the Euro, has declined by 13% from a year ago, largely to due to global capital flight from Greek, Irish, and Portuguese government bonds. If Beijing holds German 10-year Bunds, it’s suffered a 14.5% capital loss from a year ago, including exchange rate losses. The outlook for China’s bond portfolio appears bleak for 2011. The Fed has said it would continue pump an extra $450-billion of electronically printed dollars into the global money markets in the first half of 2011. The Bank of Japan is signaling that it might increase the size of its money supply, if the dollar falls further against the yen. Bank of England deputy Charles Bean has suggested that if the British economy falters in 2011, then its own version of QE-2 could be around the corner. 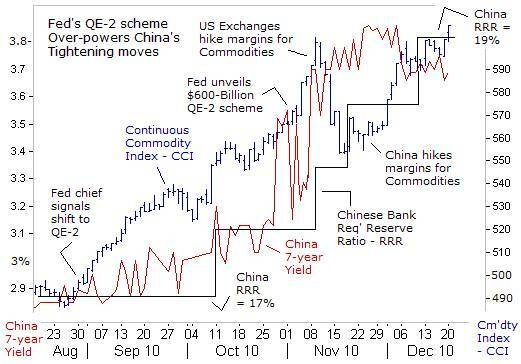 Thus, massive money printing would continue to fuel the “Commodity Super Cycle,” and work to the detriment of Asian holders of G-7 government bonds. 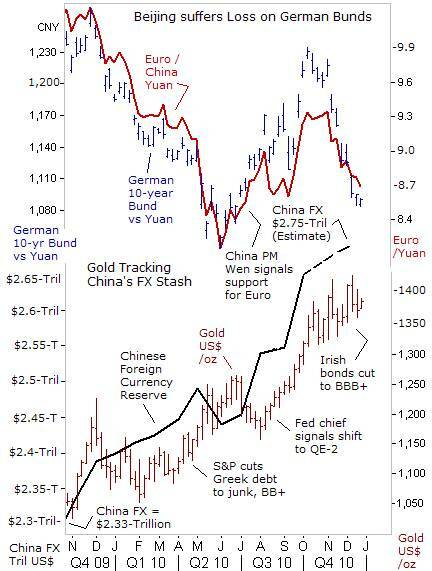 The Gold market has been tracking the growth of China’s foreign currency stash for several years. Bullion dealers reckon that at some point in time, Beijing would see the light, and realize that its massive holdings of fiat paper money would eventually revert to its intrinsic value – Zero. 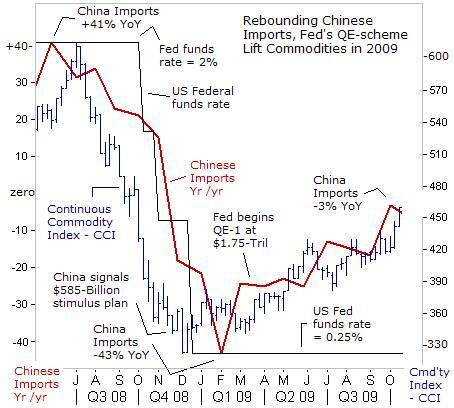 Perhaps, in 2011, Beijing would clandestinely boost its dosage of precious metals, and start selling-off large chunks of British gilts, and Japanese and US-government bonds. A portfolio shift might already be underway. China imported 210-tons of gold in the first 10-months of this year, a fivefold increase compared with the same period in 2009, - Xinhua reported. Copyright © 2005-2010 SirChartsAlot, Inc. All rights reserved.